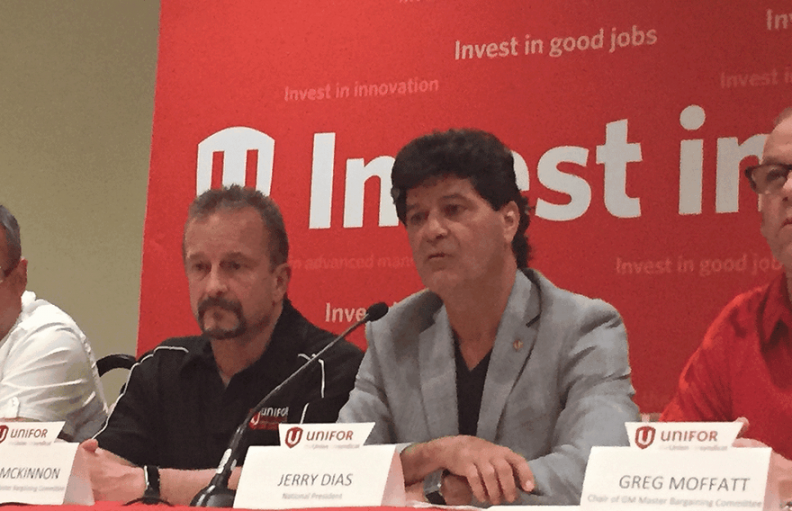 Unifor National President Jerry Dias helped convince GM to sign a new deal but is currently struggling to do the same in negotiations with FCA. Fiat Chrysler Automobiles is concerned about the economics of the deal struck between General Motors and Unifor, says union chief Jerry Dias. FCA is in talks with Unifor to reach a new labour contract after GM workers represented by the union ratified a deal with the automaker last month. The new contract with GM includes $554 million in investments and new products at two GM plants, wage gains and a defined-contribution pension plan for new hires. Speaking with Automotive News Canada in late September following the selection of FCA as the union’s next target, Dias said FCA, as well as Ford Motor Co., have expressed concerns about the GM deal’s costs. Unifor will pattern talks with FCA and Ford off the contract reached with GM. “Both of them [FCA and Ford] are concerned about the costs for the new employees,” Dias said. “Ford is making the argument that their business case for [investments in the Oakville, Ont., assembly plant] was based on the previous wage grid. So they’re not exactly amused that the grid has been changed significantly. The GM contract includes a change to the 10-year wage grid for new hires, which was implemented in the previous contract. Under the new deal, new hires will receive wage increases each year before reaching the full $34.15 hourly rate. The previous deal included a wage freeze for the first three years. That could give FCA some headaches in Windsor, where its assembly plant received significant investments over the last few years as the automaker prepared to launch the Chrysler Pacifica minivan. As part of the Pacifica rollout, FCA said in February that it would hire 1,200 new workers at the plant. Wage gains for those new hires could be more painful to FCA’s bottom line than to the other two automakers. FCA has the highest debt load and smallest profit margin of the three companies. Still, despite FCA’s concerns, Dias said the automaker knows the two sides “have to get there” on economics for a deal to be reached by the Oct. 10 deadline. Should the two sides fail to reach a tentative deal by then, FCA’s 9,750 or so workers represented by Unifor will be in a strike position. Unifor’s top priority in negotiations with FCA, like those with GM, is securing investments at key plants. Of top concern for the union is the Brampton, Ont., assembly plant, which has an aging paint shop that needs a significant upgrade for the plant’s long-term viability, FCA CEO Sergio Marchionne told reporters in August. FCA is also looking to secure investments for the Etobicoke casting plant, which builds aluminum die-castings and pistons for various models.